Kirigami Mix columbine is a formulated blend of huge, upward facing 2-3 in., blue, pink, red, rose, white, and yellow flowers. The columbines in Kirigami Mix grow 14-24 in. tall and because they need less chill to initiate flowers than other columbines, when seeds are started early, bloom is the first year. Established plants flower over an especially long season, from early spring to early summer. Kirigami Mix columbines dazzle in mass plantings, mixed borders, cottage gardens, cutting gardens, and containers. Winter hardy perennials to zone 5. Plant Kirigami Mix Columbine Seeds: Sow Kirigami Mix columbine seeds in cell packs or flats, press into soil, do not cover. Needs light to germinate. Kept at 65 to 70° F., seedlings emerge in 21 to 28 days. Can direct sow Kirigami Mix columbine seeds into prepared seed beds in groups of 3 to 4 seeds, spaced 10 to 15 in. apart. Thin to the strongest plant. 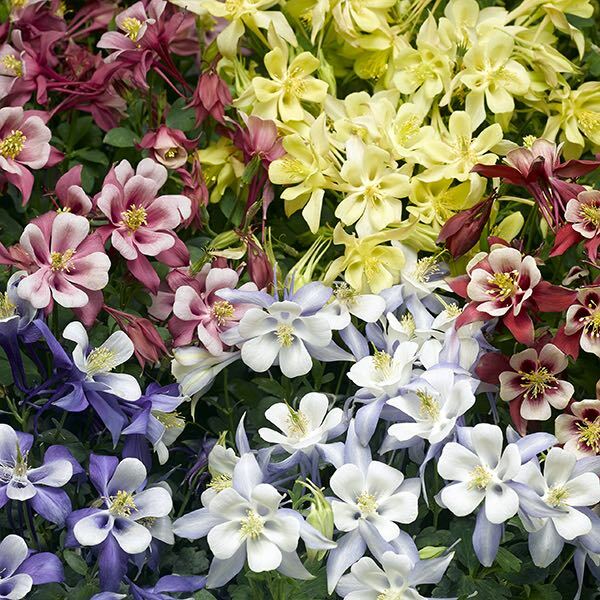 Grow Kirigami Mix columbine: Full sun in mild climates, part to light shade where it is warm. Best performance in moist, well drained soil — will tolerate average water. For cut flowers, harvest blooms as they begin to open. Typical vase life is 5 to 7 days. Pinch or cut off spent flowers to extend bloom season. Flowers attract hummingbirds and butterflies. Plants are deer and rabbit resistant.